Why don't you offer 4-pin Hirose to P-Tap Multi Breakout? While we can physically make a 4-pin Hirose to P-Tap Multi, the reason we don't offer that as a standard option on the web store is because most 4-pin Hirose outputs from cameras only supply 1.8A. That amount of current is usually only enough for a small monitor, and problems can occur if you connect more than one device. If you are using a device that can supply enough current for your application, and you would like to get a quote, please contact us. 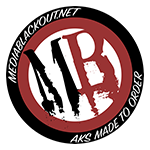 Do Media Blackout products come with a warranty? What polarity do I need for my 2-pin Lemo cable? How are BNC (and other coaxial) connectors gendered?